WANT SOME ADVENTURE? FEELING DARING? ITCHING TO DO SOMETHING DIFFERENT? How would you define an ‘adventurous spirit’? We are for all girls and young women, whatever their background and circumstances. We offer them fun, exciting activities and the chance to make lifelong friends while doing them! Everything in guiding is done in the spirit of adventure – from camping out for the first time, to learning circus skills, to abseiling, to going on a night-time walk, to attending your first BIG GIG as a Guide. I believe that everyone has an ‘Adventurer’ in them somewhere. What do you think? Absolutely! 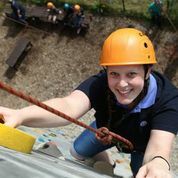 Girls in guiding can take part in a huge range of adventures on our camps, holidays and trips – from quad-biking, to orienteering and abseiling, to zorbing, canoeing and zip-wiring. But adventure doesn’t have to be about abseiling or rock climbing. A Rainbow who is six might find that her greatest adventure is visiting a local nature reserve to go pond-dipping, and a Brownie might find her first sleepover a huge adventure! We give girls the opportunities and choices to find their own adventures. How does Girlguiding help girls to ‘tap into’ their adventurous side? Girlguiding gives girls and young women a space where they can be themselves, have fun and build brilliant friendships through adventure, and we encourage each girl to find out what she loves to do – and occasionally step out of her comfort zone! The Girlguiding programme has so many ways for girls to tap into their adventurous side. Rainbows can create an indoor campsite at their meeting place with chocolate campfires and toasted marshmallows. 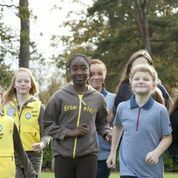 The whole of the Brownie programme is called ‘Adventure’, and includes badges such as Brownie camper, Circus Performer, Wildlife Explorer and Agility. Guides can get into Go For Its which are a way to explore themes like Experimenting, I Will Survive, Globalistic and brand new Go For It! Be the Change, which give Guides skills in leadership, decision-making, debating and advocacy – some new adventures they wouldn’t explore in other areas of their lives. 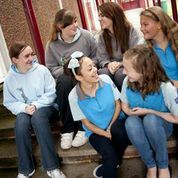 In The Senior Section, for young women aged 14-25, girls can take on the challenge of the Duke of Edinburgh Award, or the highest accolade in guiding, the Queen’s Guide Award. Both encourage participants to explore their own sense of independence, social awareness, personal skills and of course, adventure! Any advice for girls who aren’t feeling that brave right now? Count to 10 before you say no to a new adventure. What could you learn from taking part? Might it be fun? Will you be missing out if you say no? If you don’t get butterflies in your stomach when doing something adventurous? No? Then it’s not adventurous enough for you. Push yourself that bit further. If you feel you’re not adventurous, team up with someone who you think is. They’ll inspire you to take on a challenge and give you the encouragement that will help you succeed.